“Your Travel Choices” booklet in the link below. Travelling by foot is a quick and easy way of getting around Kingsmere. 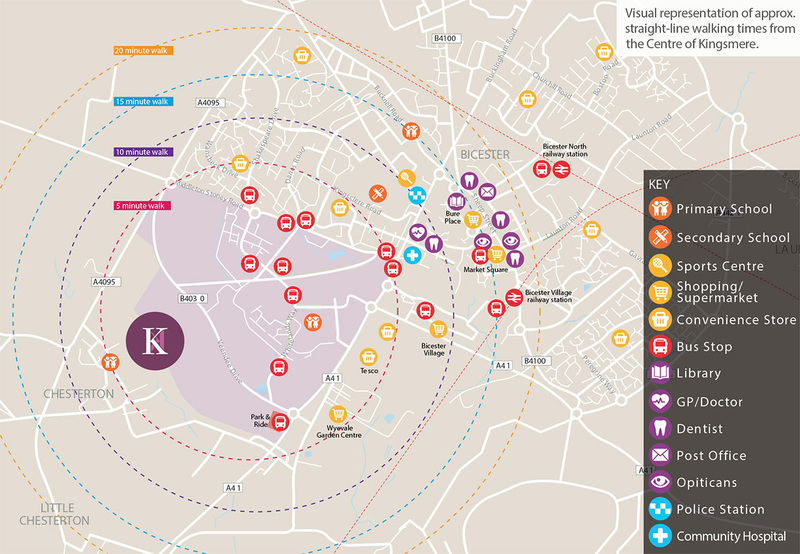 Due to Kingsmere’s close proximity to central Bicester many local facilities can be reached via a short walk. Key destinations and approximate walking times are shown on the map. 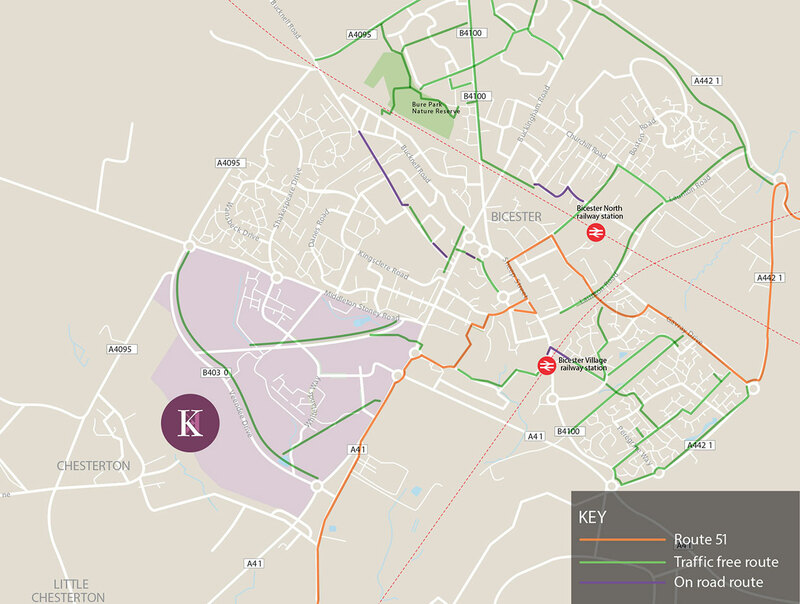 Bicester town centre can be reached in a 15 minute walk, whilst Bicester Village railway station is around a 10 minute walk from the north east of Kingsmere. Bicester North railway station is situated 20-25 minutes walk away. Additional local facilities can be accessed via a short walk, including supermarkets, local shops, leisure facilities, community hospital, primary and secondary schools. 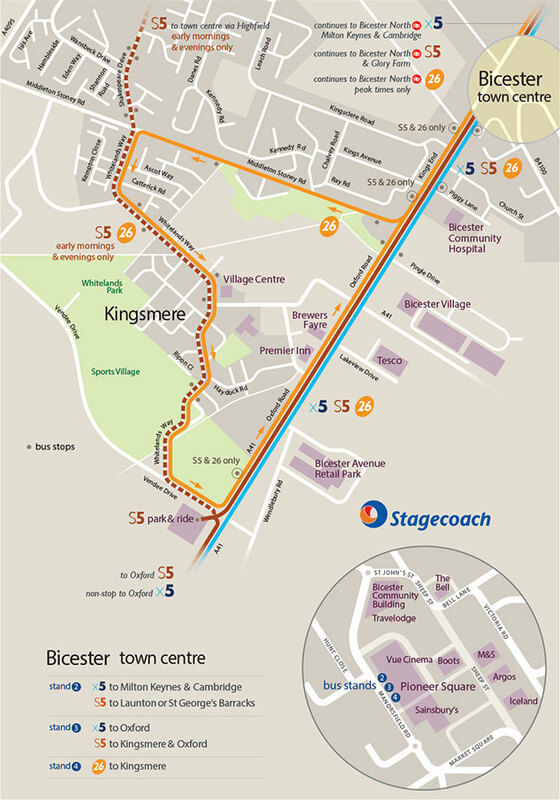 Good quality, direct and lit pedestrian routes are being installed through Kingsmere, connecting with routes to the town centre, Bicester Village and Bicester North railway stations and other destinations. Kingsmere also provides many local opportunities for recreational walking trips. Whilst many health benefits are associated with walking, you can also help minimise environmental impacts caused by car travel by walking more often as part of your daily journeys. Bicester North: By the Bicester Village shuttle bus stop and also on the opposite side of station approach. Part of the National Cycle Network (Route 51) runs along the A41 past Kingsmere. Whilst cycling can help to incorporate exercise into your daily routine it also acts as an efficient way of travelling in terms of both time and money. Bicester Green is host to a fleet of Cherwell District Council owned bikes that are fully maintained and offered out to hire from our workshop. The scheme, aimed at getting people out of their cars and onto bicycles, allows you to take up the opportunity of a free cycle loan as part of the ‘Cycle for Bicester’ programme. ‘Cycle for Bicester’ encourages more people in Bicester to give cycling a try. 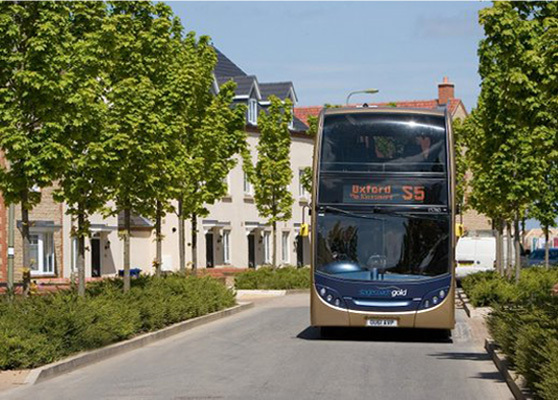 Kingsmere is served by two local bus services providing residents with direct access to Bicester and Oxford city centre. runs directly through the development connecting you to Bicester town centre. And additionally to Bicester North railway station during peak hours). to Oxford also runs through the site at peak times. At other times it can be accessed from the Kingsmere Park and Ride site or stops on the A41 Oxford Road. (Cambridge, Bedford, Milton Keynes and Buckingham to Oxford, via Bicester) can also be accessed from stops on the A41 Oxford Road. 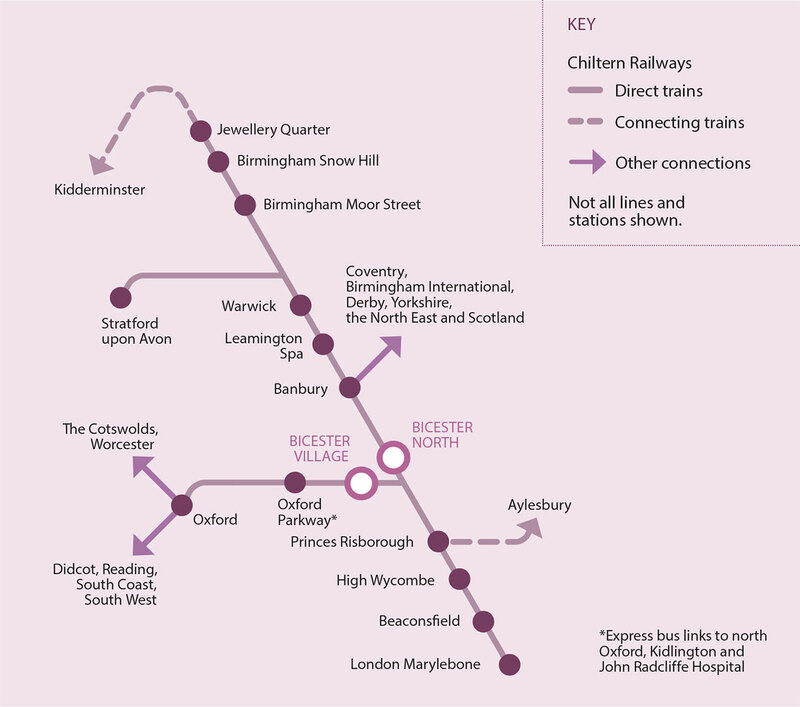 It is possible to interchange to additional services in Bicester town centre or Oxford city centre. runs from Oxford to Bicester (approximately hourly, Monday to Saturday) via Middleton Stoney Road. It is run by Thames Travel. The proximity of local railway stations operated by Chiltern Railways mean Kingsmere is highly accessible to destinations further afield. Newly re-opened Bicester Village railway station has services to London Marylebone and Oxford Parkway. A direct line to Oxford also opened in December 2016. Additionally there is Bicester North railway station with services to London Marylebone, Birmingham Moor Street, Birmingham Snow Hill, Leamington Spa and Banbury. You can cut the cost of your journey by registering as a member of a car share website. It works both ways meaning you are able to share your journey either as a driver or by joining someone else as their passenger, which is a great way of travelling to work or further afield. Oxfordshire County Council and the UK’s largest car-share network, Liftshare have created a partnership scheme. They provide a matching service for all those who live or work in and around Oxfordshire as well as longer journeys to other locations outside the county. Once you have been matched, you can choose to journey share as little or as often as you like, with whomever you choose. The service is available to anyone over 18. Joining the scheme is simple and completely free. All you have to do is register your details and then activate your account. Once you’ve registered your journey, the database searches for possible matches. When you have found a suitable match, you can then contact the member(s) using our internal messaging system.